You’re a business leader who, per chance, is at a turning point for your business. You’ve outgrown QuickBooks; either due to increased complexity of transaction, the expansion of your business beyond single-currency transactions, or just through sheer complexity of transactions; and now seek a solution that will allow you to automate simple tasks while managing increasingly complex transactions. We recently shared the guide that compared cloud, on-premises, and hosted models of software delivery; but now would like to share with you a warning. In your journey, you will come across individuals so apprehensive to the cloud that they couldn’t fathom uploading even their least personal data to the cloud. Unfortunately for their opinions, their own banks utilize cloud computing to manage their payments. We look to share some of the common myths that people will share about cloud computing and cloud accounting. Just look at the recent breach affecting the celebrities you know and love. People will bring this and other security breaches up before you can even finish the phrase cloud computing. Well, that’s good for them. Both internally and externally, cloud security measures are built to protect data. Fact: Go down to a common server room. How many armed guards do you have? Do you run a yearly hackathon? Does your company offer two-step verification with mandatory password changes? Further, data is encrypted as it travels between your browser and the application. This applies not only to the primary data center, but also to each backup executed to protect your information in the event that the primary facility goes down. Fact: These minor outages are uncommon, overstated, and under-researched. Over the past year, cloud accounting provider Intacct has averaged 99.985% uptime. For more on the uptime guarantees and the Buy with Confidence Guarantee, link here: What to Expect in a Service Level Agreement. A surprisingly common myth that we’ve heard from cloud naysayers is that anyone else in the cloud can access financial data if it’s stored there. Fact: This is like saying, “If you live in an apartment complex, everyone is welcome to your stuff.” If you chose a provider such as Intacct, you have the obvious “no one outside the company” protection, but you can even choose what people in your organization have access to specific dashboards, who can modify data, and who can even see the financials. Many people have had problems moving data from one server to another, setting up new software on-premises, or even upgrading current QuickBooks software, and think that the cloud would be even harder. Fact: This couldn’t be further from the truth. Intacct provides a simple Comma Separated Value (CSV) upload, an option to upload a QuickBooks Company File, or an easy upload via Scribe Online. Sound easy? There have been reports of cloud implementation issues or stories of data retrieval gone wrong. More common with the seedy underbelly of the cloud providers, in which the SLA prevented companies from retrieving data without an exorbitant fee. Fact: Your Service-Level Agreement should be simple to understand, and provide guarantees to protect your business. With Intacct, you always own your own data, and can back up information onsite in addition to the two different locations that Intacct uses to secure and provide redundancy to your data. You may have gotten the hard sell from a traditionalist (see on-premises software provider) who either implies or directly tells you that his/her company can provide (application) in the cloud. What they really mean is that they will set you up with an accessible, hosted application. Fact: Although still better than a traditional, costly, on-premises software; a hosted solution is basically nothing more than on-premises through a layer for online delivery (Citrix, etc.). For more information on the difference, including implementation time, deployment, customization, and accountability, see our comparison of On-Premises, Hosted, and Cloud Computing Solutions. People have once again been relayed a horror story about [application]’s bill being double what they had already expected. These horror stories have generally come as a result of an Infrastructure-as-a-Service, in which developers were provided ‘instances’ for scalability. No Cost of physical installation and deployment of servers. The most pressing and least believable myth of all. Not all Cloud Accounting Solutions are created equal. 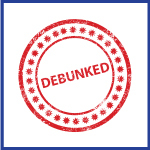 We’d like to offer our own comparisons from former blogs to debunk this glowing myth. Now that you know the facts, we welcome you to check out our accounting software selection checklist to further understand your path to become an informed software buyer. We finally welcome you to contact us to learn more about improving your financial software with Intacct.